…In 2008 the Senate passed a measure that would have limited interrogators, including those working for the CIA, to the techniques set forth in the Army Field Manual, and thus would have outlawed waterboarding. That bill was vetoed by President George W. Bush ….Consider also Sen. Feinstein’s language. Dismissing the conclusion by the Justice Department’s Office of Legal Counsel that the CIA techniques were not torture, she says it “is my personal conclusion that, under any common meaning of the term, CIA detainees were tortured. 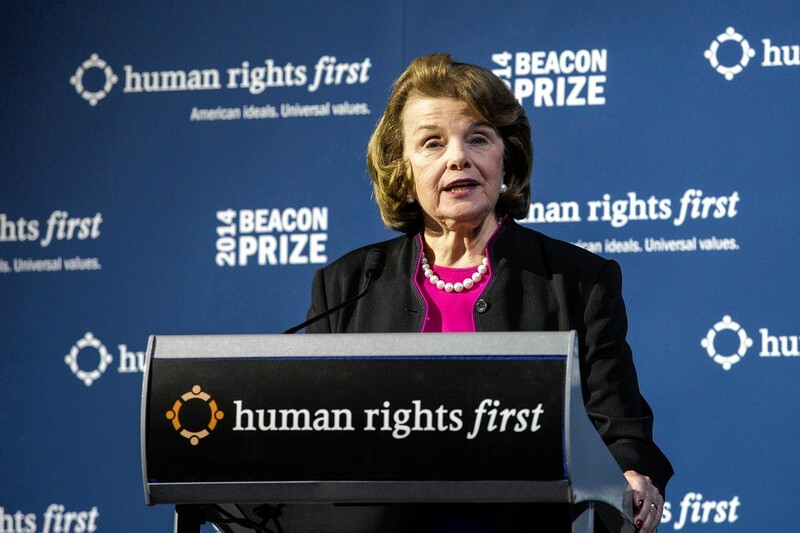 I also believe that the conditions of confinement and the use of authorized and unauthorized interrogation and conditioning techniques were cruel, inhuman, and degrading.” Which is to say, Sen. Feinstein wins the argument only by defining herself as both the standard setter and the winner…..As for the views of Sens. Feinstein and McCain and others about what is legal or illegal, this nation of laws is governed by what is in those laws, not by what at any given moment is in the minds and mouths of those who enact them.”, Michael B. Mukasey, “The CIA Interrogations Followed the Law”, Wall Street Journal. Mr. Mukasey served as U.S. attorney general (2007-09) and as a U.S. district judge for the Southern District of New York (1988-2006). Some of those now criticizing the program as illegal seem oddly uninterested in the laws they themselves helped write. Considering that the now-abolished Central Intelligence Agency interrogation program adopted in the wake of 9/11 was intended to protect the U.S. from another deadly attack, it is stunning to hear those now criticizing the program issue the solemn reminder that “we are a nation of laws”—while devoting little attention to what was actually in those laws. Odder still, among the critics those who wrote the laws seem to devote the least attention to them. Take, for example, Sen. Dianne Feinstein, the prime mover behind last week’s release of a more than 500-page “ Executive Summary ” of the report by Democrats on the Senate Select Committee on Intelligence. She attaches her own six-page foreword, beginning with the dutiful assurance on the first page that the “horror” of the television footage of the 9/11 attacks “will remain with me for the rest of my life.” Thus credentialed, Sen. Feinstein proceeds to the task at hand: CIA personnel “decided to initiate a program” of “brutal interrogation techniques in violation of U.S. law, treaty obligations, and our values.” Setting aside for a moment the reference to “our values,” that statement is demonstrably false. Laws are a technical business in which both terminology and chronology play a part. So if the law that criminalizes torture defines it in a certain way, that definition—and no more—is what it is, punditry and cocktail-party figures of speech notwithstanding. In September 2001, there was but one law that defined torture, making it a crime to act with the intent to cause “severe physical or mental pain or suffering.” Severe physical pain or suffering is not defined. Severe mental pain or suffering is defined as “prolonged mental harm” resulting from any of four causes, including causing severe physical pain or suffering. So, to take the harshest of the techniques used in the CIA program, and the one that has therefore become emblematic of them all, the central question is whether waterboarding as applied by the CIA to the three terrorists who underwent it would have caused severe physical or mental pain or suffering. The procedure used by the CIA involved placing a detainee on a flat surface with his feet slightly elevated, placing a towel over his face, and pouring water over his nose and mouth repeatedly for periods that did not exceed 40 seconds. If that does not cause severe physical or mental pain or suffering, it is not torture, and those who applied it cannot reasonably be said to have acted with intent to cause such pain or suffering. It was not torture, for at least two reasons. First, Navy SEALs for years have undergone waterboarding of that sort as part of their training, and they report that the procedure does not cause much physical pain at all; their splendid careers show that it also does not cause severe mental pain or suffering as defined in the law. Second, 9/11 mastermind Khalid Sheikh Mohammed, perhaps the worst of the three waterboarded terrorists, eventually came to know the precise limits of the procedure and was seen to count the seconds by tapping his fingers until it was over. Some torture. Arguably, what broke him was sleep deprivation, but in any event he disclosed reams of valuable information. At last report, he is doing just fine. Our treaty commitments in those post-9/11 days—agreements that also have the force of law—were expressed in a statute that criminalized any “grave breach” of the Geneva Conventions. Because of a later Supreme Court ruling, Article 3 of the Geneva Conventions could be read to protect even unlawful combatants who adhere to no rules of combat and who were never intended to be protected by treaties drafted to promote adherence to the accepted rules of combat. The definitional sections of that law, as amended by the Military Commissions Act of 2006, show that what it makes criminal are egregious acts similar to those already made criminal by the domestic torture statute. Restrictions imposed by the Detainee Treatment Act of 2005 are framed in opaquely general terms—e.g., “cruel, inhuman or degrading treatment or punishment.” Those provisions at their broadest are read to impose limitations on the federal government no broader than those contained in the Due Process Clause of the Fifth Amendment and in the ban on Cruel and Unusual Punishments in the Eighth. The latter is read to apply to treatment imposed as “punishment” on the convicted, and therefore wouldn’t apply to interrogations of detainees for investigative purposes. As to the Fifth Amendment, the Supreme Court has said that the treatment barred by the Due Process Clause is an abuse of power that “shocks the conscience,” and that “what shocks in the one case is less egregious in the other.” Which is to say that it matters what is at stake—like, say, national security. Was all this dry and abstruse stuff known to Sen. Feinstein at the time that she presented the CIA report and wrote the six-page aria that constitutes her foreword? Consider that in 2006 she co-sponsored an amendment to the Military Commissions Act that would have classified waterboarding as torture; the amendment was voted down. In 2008 the Senate passed a measure that would have limited interrogators, including those working for the CIA, to the techniques set forth in the Army Field Manual, and thus would have outlawed waterboarding. That bill was vetoed by President George W. Bush . Insofar as she damns conduct that occurred before the formal CIA program was in place in the summer of 2002, or was otherwise outside the program, that conduct was reviewed in multiple investigations and no criminality found, save for one prosecutable case in which the defendant received a 12-year sentence. Which is to say, Sen. Feinstein wins the argument only by defining herself as both the standard setter and the winner. Also, if she is looking for a “common meaning” of torture, how about something like a procedure to which no rational person would submit voluntarily? More journalists have tried the experience of being waterboarded than terrorists were subjected to it. That wouldn’t be the case if, for example, we were talking about needles under the fingernails. And what of “our values,” which not only she but also Sen. John McCain —a man whose fortitude in the face of real torture by the North Vietnamese gives him nearly unique moral stature—have claimed were violated by the CIA program? Others with credentials similar to Sen. McCain’s, including Medal of Honor recipients and fellow Vietnam prisoners of war Leo Thorsness and Bud Day, believe in the efficacy and morality of waterboarding. Moreover, and particularly at a time like this, I think it is important that we resist the New Age conceit of seeing each act of our government as an expression of who we are, and each act by its officials as an expression of who they are. Brave and serious men and women, faced with the most terrifying attack in American history, and—along with the rest of us—fearful of more, devised and executed a program to get intelligence from captured terrorists who refused to cooperate. Former CIA directors and deputy directors have recently described in these pages how that program succeeded. Theirs was an act of national self-preservation, not of national self-expression. As for the views of Sens. Feinstein and McCain and others about what is legal or illegal, this nation of laws is governed by what is in those laws, not by what at any given moment is in the minds and mouths of those who enact them. Mr. Mukasey served as U.S. attorney general (2007-09) and as a U.S. district judge for the Southern District of New York (1988-2006). Posted on December 17, 2014, in Postings. Bookmark the permalink. Leave a comment.